Home › American politics › Is it Trump or Clinton? Yikes! This election reminds me of Jane Byrne’s election as mayor in 1979. Byrne was marginalized by the media which said she can’t win. For the first six months of her administration, she was a rollercoaster of contradictions, controversy and insanity. She ended up dumping her “reform” allies and cut a deal with the very “Evil Cabal of Men” she had campaigned against. That “craziness” opened the door to real change. Click here to listen to the podcast, or use the widget below. Here are my gut feelings about this election. For a man known for brilliant TV oratory, Trump has a horrible manner of speaking. He is unclear, often confusing, and he shoots-from-the-hip. The ugliness of the Trump-Clinton fight is worsened by the absence of good journalism. Trump can’t seem to explain what he really means, and the news media is happy to twist it even more. The media is like a surfer who looks for a good wave to ride. But this wave is on the Internet’s cesspool of screaming, yelling and cacophony of insanity. The media doesn’t lead, but rides that wave of hysteria driven by social media. A good example is Trump’s plan to confront drug trafficking and violence along the Mexican border. The media and Clinton assert Trump is “anti-Mexican,” twisting Trump’s carelessly spoken words. Trump wants to prevent drug dealers, rapists and killers from entering this country. Anyone can walk into this country from Mexico in a violation of immigration laws. Many are good people seeking better lives. But others are like El Chapo, the cutthroat gangster who killed thousands of Mexicans and many Americans, with protection from Mexican government corruption. Clinton claims she wants to resolve this immigration dilemma. But all she has done is ignore a solution allow the status quo to worsen. We have more people entering this country illegally than ever before. It’s much like issue of Muslims. Trump doesn’t hate Muslims. He wants people to filter out the bad from entering this country from the Islamic World, which is racked with violence. The way he said it is terrible, but the intent is good. Trump may have poorly phrased the issue, but the truth is many women in this world, particularly in the Arab and Muslim world, are oppressed by men. More than 1,000 Pakistani women are murdered annually in “honor killings,” killings sanctioned by the society and the government because the women “disgraced” their male relatives. In one case, a pregnant Pakistani girl was buried in the ground up to her neck and stoned to death after being accused by her father and brothers of marrying a man they did not like. In Jordan, laws protect men convicted in “honor killings” by reducing their jail time to a few months. While Trump’s words may offend your moral compass, Clinton’s record offends mine. Clinton voted for the Iraq War, on the false claim Iraq was involved in the Sept. 11, 2001 terrorist attacks. Clinton voted both times to support the Patriot Act, which has undermined our civil rights, including those of Muslims and Mexicans, too! And, she is among Democratic leaders who have exploited immigration, doing nothing allowing illegal border crossings to continue. Her failure to intervene properly in Benghazi is tragic, and her emails are filled with outrageous abuse of the public trust. The real tragedy is the national media will not allow a real discussion of the issues. By keeping it about Trump, the media is shielding Clinton and selling Americans short. 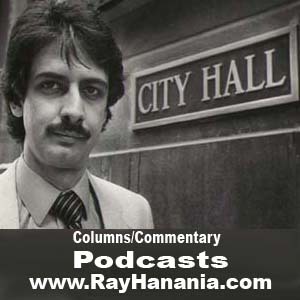 Southwest Community News Group syndicated columnist Ray Hanania joins host Bruce DuMont on Beyond the Beltway Radio Sunday, August 14, from 6 to 8 pm live on WCGO 1590 AM Radio. The program is also broadcast live on Sirius XM Radio POTUS Politics Channel 124 on from 6 until 8 pm. For more information, visit Hanania’s website at http://www.RayHanania.com. For more information on Bruce DuMont, visit his website at www.BeyondtheBetlway.com.